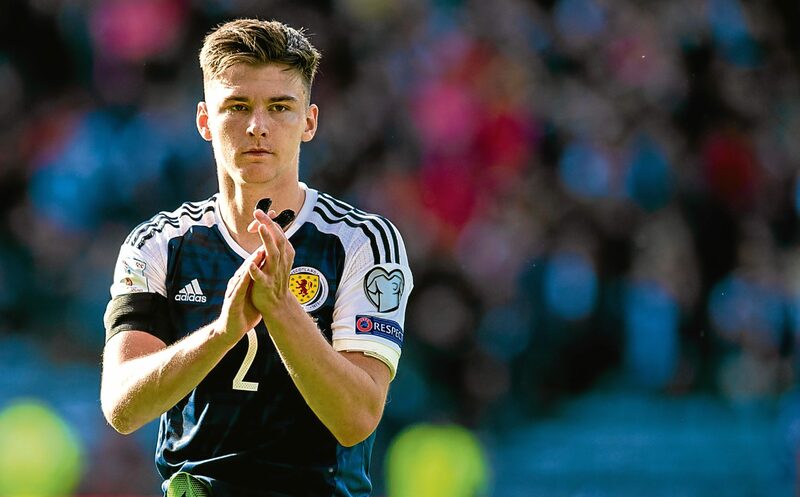 KIERAN TIERNEY has the right stuff to captain Scotland for the next decade. That’s the view of his Celtic team-mate, Callum McGregor, after a night which saw him make his Scotland debut and Tierney become the second-youngest player in more than a century to skipper the Scots. At 20 years and five months of age, the Hoops sensation is just one month older than Darren Fletcher was when he first pulled on the armband in 2004. Fletcher still captains his country 13 years later and McGregor reckons Tierney can follow in the Stoke City star’s footsteps. “There’s no reason why he can’t. He did magnificently well in his first game as captain and he’s improving all the time,” said McGregor. “He’s unbelievable. To be captain of your country at such a young age shows he has the mentality. “It was another great performance from him. He just gets better and better – and in a different position again. “He’s adding the ability to play centre-back to his game now as well. But to be fair, you know wherever you play him, he’s going to give you a performance. 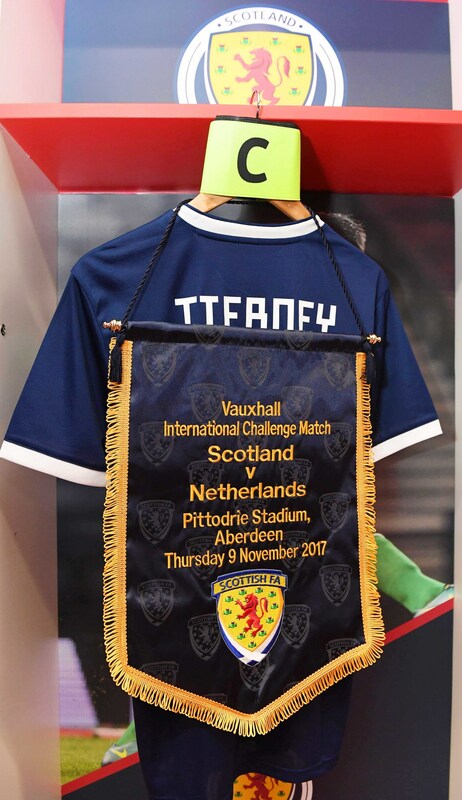 “The fact no one was surprised he was captain of Scotland for a game against Holland says a lot. “We walked into the dressing room and saw the armband next to his place and no one even blinked. “We all thought it was perfectly normal. That’s how we found out – and we were delighted for Kieran. “He’s been outstanding for Celtic since the minute he came into the team, and he’s carried that into international football. “He’ll not be fazed by any of it, either. He’s just that type of boy, totally level-headed and he takes it all in his stride. “He’s one of those boys who leads more by example than by shouting at people. “You can have two different types of captain. The vocal ones and the ones who do, rather than talk – and Kieran’s probably in the latter camp. McGregor’s absence from Scotland squads during Gordon Strachan’s reign was a source of puzzlement to the Tartan Army. Having finally been given the nod by interim boss Malky Mackay, he is looking to the future in the hope that whoever takes charge on a permanent basis is more of an admirer. “I think it looks positive, what we did against a good team like Holland,” he said. For McGregor’s fellow debutant – and on-loan club-mate – Ryan Christie, “attacking” and “creating” are the constant watchwords. But had Aberdeen gaffer Derek McInnes failed to swoop in the summer to take him to Pittodrie, Christie fears he would have been restricted to strutting his stuff on the Celtic training ground. In taking the chance to go out on loan, Christie followed the example set by ex-Notts County loanee, McGregor. Now both are being rewarded, and Christie is as delighted at his pal’s rise to recognition as he is grateful for his own ascent. “I am happy I managed to get out on loan to Aberdeen when I did because I felt I was probably plateauing a bit as a footballer,” he said. “That can only be detrimental to your career. “Callum is a great person to look up to, in terms of how he went away on his loan, came back and now the football he’s playing is brilliant. Dons boss McInnes may sink in the Pittodrie punters’ estimation if he decides to up sticks to Ibrox and become the new Rangers manager in the coming days. However, Christie’s opinion of the man he credits with rescuing him from the relative obscurity of the Celtic bench will not be easily altered. “Derek McInnes has been a massive factor in this,” said Christie. “That was the main reason I came back to Aberdeen on loan because I liked playing under him so much. “I think it shows on the park. He lets me go out to express myself every Saturday. “Players like me can’t ask for much more than that. “I’m delighted that I’ve come into Aberdeen this season and stamped my name on the starting XI most weeks.